A man accused of harassing a Middle Eastern family by throwing nails at their vehicles was arrested Wednesday, according to the Pasco County Sheriff's Office. PASCO COUNTY, Fla. — A man accused of harassing a Middle Eastern family by throwing nails at their vehicles was arrested Wednesday, according to the Pasco County Sheriff's Office. Deputies say David Allen Boileau, 58, of Holiday, reportedly threw nails at the family's vehicles and broke into their home in Holiday. Boileau told deputies he entered the unsecured gate of the property belonging to the family and then proceeded to walk through an unlocked door and exited the home through the front door. He told deputies he didn't take anything while in the home. Then he said that he walked up to the mailbox, opened it, and told deputies he saw immigration paperwork for the family. A neighbor saw Boileau and confronted him, telling him he was calling law enforcement. The family was not home at the time Boileau entered and exited the home. Deputies interviewed the victim and the victim told them a black hand purse with 4 credit cards, 1 debit card, 9 gift cards, a food stamp card and an ID was missing from the home. 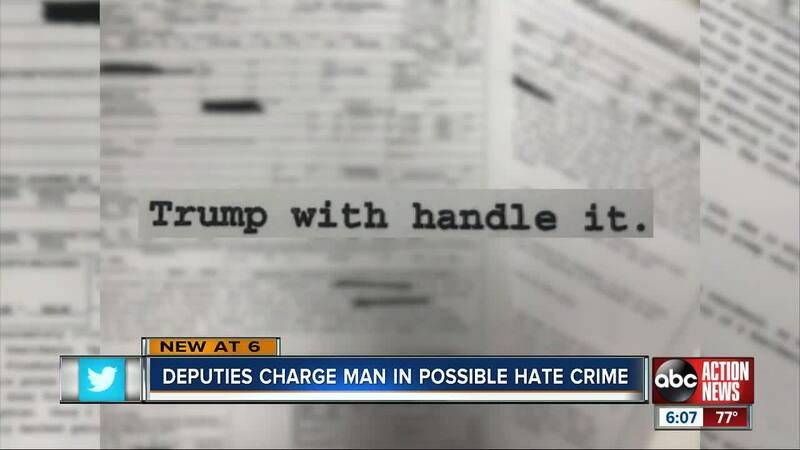 Deputies are calling the incident a possible hate crime due to the fact that Boileau "uttered several statements of his dislike for people of Middle Eastern descent" before he was read his Miranda Warning and Post Miranda, according to the arrest documents. He reportedly made statements of the United States needing to "get rid of" people with Middle Eastern descent. The arrest report says Boileau said if he doesn't "get rid of them, Trump with [sic] handle it." In a "special note" on the arrest documents, deputies say this is not the first time Boileau has been involved with the victim's residence. The witness told deputies Boileau made statements like "the US needs to rid the country of all of them" and "we'll get rid of them one way or another." Deputies also say Boileau reportedly threw screws at a family vehicle "in hopes of damaging it or them running over the nails and flattening their tires." Boileau has been charged with Burglary of an unoccupied dwelling. ABC Action News spoke to the family of the victim who did not want to identify herself, but said that Boileau just doesn't like them. "He thinks we're bad people," she said, "I know there's some bad people from the Middle East, that's why we're here." The sister of the victim tells us the family is here legally in the United States because she was an interpreter for the US Army in Iraq for two years. "That's why we came here because our life was in danger," she said. This case will also be handed over to the FBI who investigates hates crimes.